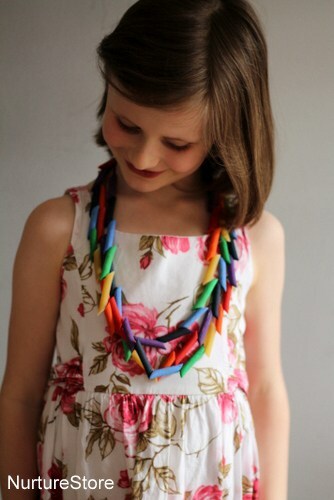 Here’s a pretty kids craft that looks gorgeous and also works on fine motor skills :: threading a rainbow necklace! 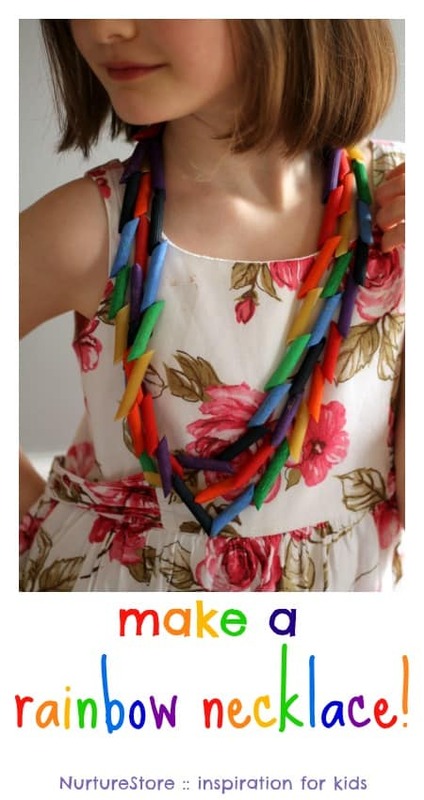 A pasta necklace is one of those classic kids crafts, isn’t it? I can remember making them as a child, and love passing along the tradition to my daughter. She loved making hers – especially in a bright and happy rainbow pattern. The threading involved also happens to be a really good work out for fine motor skills, encouraging nimble use of fingers. 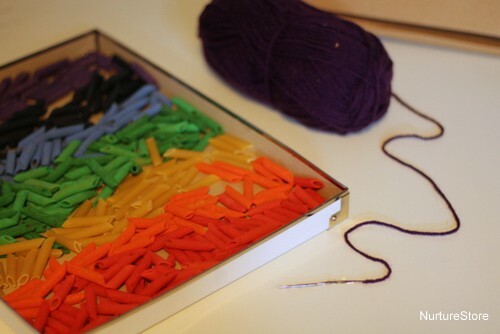 To make a rainbow necklace we used some of the penne pasta from our rainbow sensory tub and a length of wool (or ribbon) – head over here to see how to dye pasta. Wrapping some sticky tape around the end of the wool will make the threading much easier, as the wool will easily pass through the hole in the centre of the pasta tubes. Then all you need to do is thread on your pasta. In one end, and out the other, until you have a necklace that’s the right length. 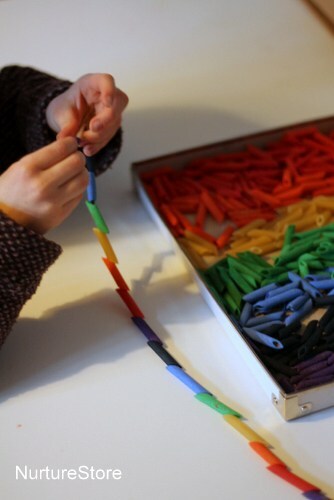 You can of course use any colour pasta you like, and in any pattern order, but my girl wanted to make a rainbow necklace. 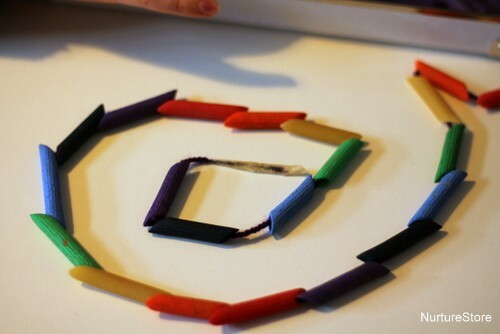 This craft is also great to link maths play, as you can make all sorts of repeating patterns along your necklace. 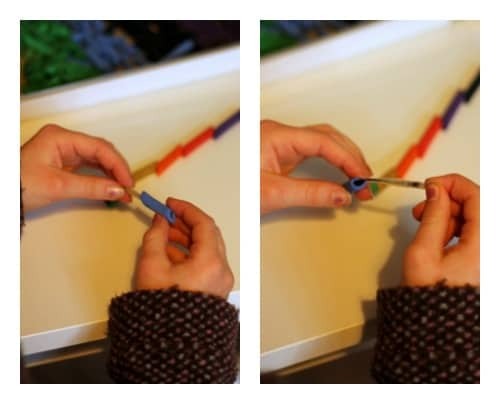 Keep going until you have enough links on your necklace to makeit the right size for your child – or if you’re really enjoying yourself you can keep going and going, to make a long necklace that you wrap around a few times. Super stylish! We tied the necklace at the back with a simple knot, but you may prefer to glue a piece of velco to each end of your ribbon, so the ends will pull apart easily.